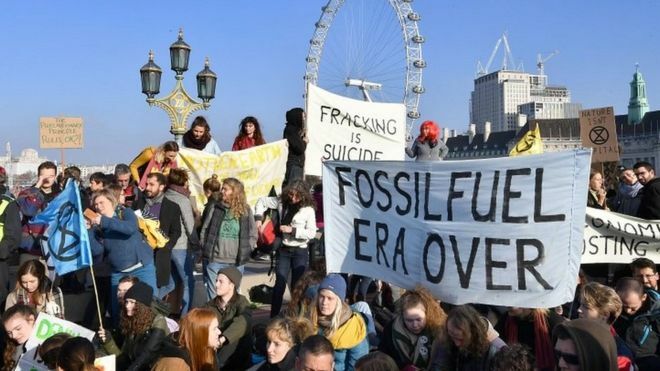 Sit-down demonstrators blocked five bridges over the River Thames in the city centre, including Westminster Bridge next to the Houses of Parliament. "We've basically got three demands," said Gail Bradbrook, one of the organisers. "One is that the government have to tell the truth. People think that climate change is something happening to somebody else at some other time, but it's coming home. "We need to go to net zero carbon really quickly. And we're also asking for a people's assembly so people can decide how the change happens." Demonstrators held placards reading "Stop climate breakdown", "Climate change equals mass murder", "Climate crisis is a health crisis. Act now" and "Denial is not a policy". The police said the demonstrations were impeding Londoners and the emergency services from using the bridges. "So far we have made 45 arrests for offences under the Obstruction of Highway Act and Bail Act," said superintendent Waheed Khan.